The headstone of Private James Walter Grady (1924-1945). A resident of Sanford, Florida, Grady was a private in the U.S. Army during World War II. He died during his service in France and is currently buried at the Epinal American Cemetery and Memorial in Dinozé, France. Grady is one of 85 Florida residents interned at Epinal. Grady was born to Meothel Grady and unknown mother. He worked as a farmhand in the Sanford area prior to his enlistment into the Army on September 1, 1943. Because he was an African American, Grady was assigned to a segregated unit of the 3126th Quartermaster Service Company. Prior to their deployment in France, the 3126th was stationed at Maindy Barracks in Cardiff, Wales. 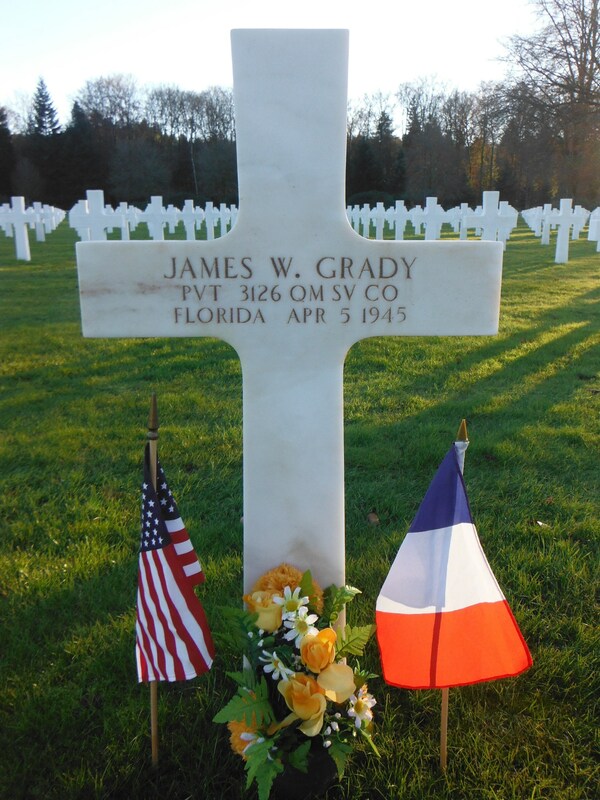 Grady died in France on April 5, 1945. Anderson, Dwight. 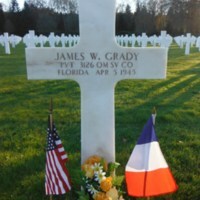 “Headstone of Private James Walter Grady at the Epinal American Cemetery and Memorial.” RICHES of Central Florida accessed April 23, 2019, https://richesmi.cah.ucf.edu/omeka/items/show/6532.